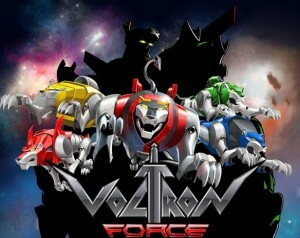 Now I understand, this isn’t meant to be the same Voltron we grew up with. Its continuation, sure, but it’s now meant to focus on a younger generation of viewers like the original did with us as kids. Thus, when the original Voltron team has aged to be in their mid 20’s, you need to bring in something said new younger generation can relate to. Hence, we have the cadets Daniel, Vince and Larmina introduced. This alone is not bad, and actually is refreshing to bring in new characters to develop. However, rather than introduce these new cadets that are obviously meant to be the eventual replacements of the original team in a gradual and build up to them while also developing everyone else in the process, they are instead forcibly shoved in our faces all at once and we’re meant to focus on them all at the same time. Ok, that in and of itself isn’t a huge mistake, as it happens often in stories. 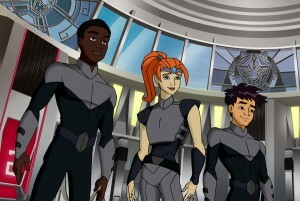 However, you are then treated to the majority of the first season devoting itself to making sure you know these kids are the next Voltron Force, often overshadowing even the original characters. Daniel is shown to be as fast or faster a pilot as Lance, Larmina has more raw fighting power than Hunk or Keith, and Vince is Pidge v2.0 with stronger spiritual connection than Allura. I know these cadets are meant to help the younger generation identify with the show, but did the writers completely forget that the older generation is watching too? I just saw it as a general annoyance that built up over time to the point it made me start to dislike the cadets themselves, through no fault of their own. Some people are going to be like “Really? This pisses you off? 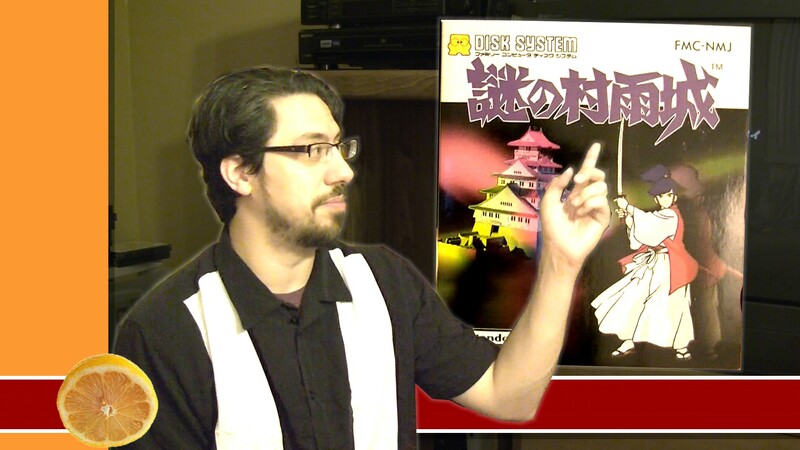 This is minor” when I explain it, but it still was something that really irritated me. Most of the older generation know that there was the American Voltron that we saw, and the Japanese GoLion. While the premise of the two were the same, there were some stark differences, mostly having to do with the localization of GoLion to Voltron needing to tone down the violence and mature themes that weren’t suitable for the kids that the show was aimed at in America. Granted, I think kids were a bit more mature and able to handle things in the USA than the censors gave us credit for (Batman: The Animated Series had some pretty dark themes, for instance), but when main characters are killed off and there’s implications of lust and sexuality thrown into the mix, it was just as well that perhaps they stayed in Japan. However, when Voltron Force came out, there were a lot of things that were taken from GoLion plot that were re-inserted into its Voltron cousin. The first act of this is that in the original end of Voltron, Lotor & “Sven” lived after their fight, while in GoLion it was the counterparts of Lotor and Sven’s younger brother and they died in combat, Sven having actually died much earlier in the series. In Voltron Force, they actually do kill Lotor off right in the beginning as the prologue, and Sven was implied to have been killed as well. I remember seeing this and going “Whoa, are they actually going to be using the GoLion plot? That’s so awesome!” This was further evidenced by Haggar being killed by Lotor prior to Voltron Force, just as had happened in GoLion, and the much more cruel natures of both Drule and certain humans like Sky Marshall Wade. Surely this new group of writers is going the GoLion route and taking kids seriously again! The Sven shows back up. “Oh, ok.” I thought; “Maybe he just got resurrected and is being used by Lotor against the Voltron team.” Turns out that, so, he was just secretly in exile. Oh, and he has a kid now, somehow. So, there goes a rather large step Voltron Force could have made going forward, and instead stepped back one. The kicker is when, all of a sudden, Nanny shows up. In the original GoLion, she’d died taking a shot meant for Coran. In Voltron, she just basically disappears. I always thought the GoLion route was so much more meaningful, because you had an otherwise useless and annoying character suddenly be valiant in the end. For them to continue that in Voltron Force could have been even more meaningful. But nope, she makes a cameo for one brief moment to basically show that she was still relevant somehow, and then never seen from again. This just shows how Voltron Force picks and chooses its plot points, rather than dedicating to one or the other and giving the storyline and richer and deeper backstory. It might be a minor gripe, but it was enough to make me nearly swear off the entire series altogether after that point, because it just seemed like they were pulling their punches and dropped the ball on something that could have actually taken kids seriously again. This also will become more evident in my next two gripes….. 3. )Allura & Lotor – Wasn’t that a thing? Remember how a major plot point of the original Voltron was how obsessed Lotor was with Allura? Honestly, right after trying to usurp the Drule throne from his father, Lotor’s primary objective was making Allura his woman. It was a driving character device that helped drive the plot as well, as often an episode might have a secondary plot involving Lotor’s desire to obtain Allura for himself. 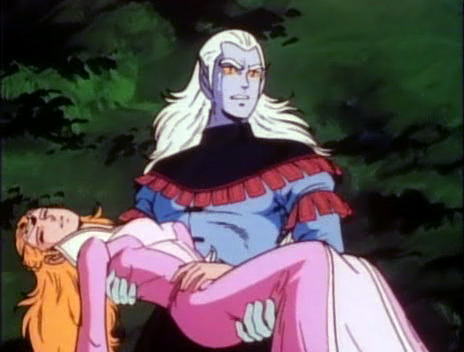 This infatuation with the princess gave Lotor a bit more characterization that set him apart from all the other Drule characters that simply wanted to destroy things and rule the universe. It also gave Allura one more things to grow strong against, since she was constantly having to beat Lotor off with a stick (hehe, beat) and that developed her character as well. Then Voltron Force comes about, and you want to know how many times we witness Lotor even bother pursuing Allura at all? Once, maybe twice. That’s it. Lotor maybe takes all of about 5 minutes between these two episodes to really give any hint that he wants the princess at all. Instead, his character is devolved into the aforementioned villainous monotony of simply wanting Voltron destroyed and the galaxy made his. I thought this was a huge disservice to the character, even though his former obsession may have been seen as a character flaw. At least it still was character. So, the first episode of Voltron Force comes about, and we’re reintroduced to Allura. Fantastic! We get to see how the princess has grown as a character and a woman into a role of an royal action girl and see where it goes from there. Except for the fact 2 minutes later, we’re introduced to Larmina, who she says is her niece. So in the original Voltron, Allura had no siblings. She was an only child and said as such. She had an aunt and two cousins. That’s it. So where the hell did a niece comes from? We’re not told a single thing of how she came to be. Is she actually Allura’s aunt’s kid that was never mentioned in the original series? Was she some other distant relative who uses the title of “aunt” with Allura as a sign of respect and familial ties? Did Voltron Force try to take another plot point from GoLion in that Allura/Fala originally did have siblings but they were all killed by the Drule, and maybe one of them popped out a kid beforehand? WE DON’T KNOW. The show never tells us a thing about Larmina’s past or ties to the Arus family throne. She’s just there as another main character from Arus, and hey, lets make her Allura’s niece somehow. Why the hell does this show give us a ton of explanations about certain things and next to none about bombshells like that? So remember how I said that in Voltron Force, Haggar did indeed die like she did in GoLion? Well, turns out she somehow became a quasar in the process. That’s right, she because a heavenly body. Must happen all the time in the Voltron universe too, since no explanation is given as to how that happened either. It just did. So not only is she now a quasar, it’s the source of the series’ villainous MacGuffin, “Haggarium”, which conveniently acts like kyptonite to pretty much all the heroes and Voltron alike. (but somehow powers-up the bad guys) Oh, and it happens to be everywhere, so each episode is pretty much guaranteed to have Voltron temporarily incapacitated by Haggarium in order to give the Monster-of-the-Week an actual fighting chance and create “suspense”. In reality, I believe it to be just lazy writing. 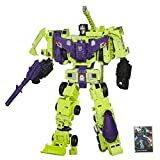 Rather than take the time to create special circumstances and abilities that actually make the villains that Voltron fights legitimately dangerous and a true threat, instead Haggarium is used liberally to create a false sense of danger when really, it’s just a temporary state each and ever time. And boy, does it get stale fast. The sheer fact that the mineral has such a wide variety of powers and effects it can grant, either positive or negative depending on the simple fact if you’re a bad guy or a good guy, just makes the whole concept truly too convenient and takes away from the experience. The horrid opening theme. Seriously, who thought that rap/hip-hop was a good opening for a Voltron cartoon and where do they live so I can knock some damn taste into them? If the original series theme didn’t come in during the ending credits, I might have stopped watching the series alotgether before I got much past the 1st episode. Agree with me? Think I’m full of crap? Comment below! I dunno, that theme song wasn’t bad. Kinda reminded me of those sprite commercials from back in the days. I didn’t care for the opening at first, but it did kinda grow on me. I still enjoyed the show, and want more, but it does have it’s flaws. Same for the current comic. I don’t feel that either truly follows the original Voltron series, but rather follow their own alternate universe version of it. Which is fine.